Quick post today. I have about five different things I’m making for tomorrow and need to get cooking and prepping immediately! There are people who believe in barbecuing outside no matter how cold it is, how much snow is on the ground, nor how many times the wind blows out their flame. So how to have the classic football food, barbecue? 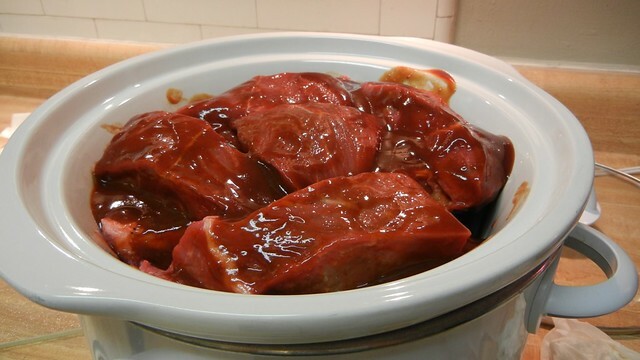 Your slow-cooker. (Or if you are brave, in a large, heavy stockpot on the stove over, low, low heat.) 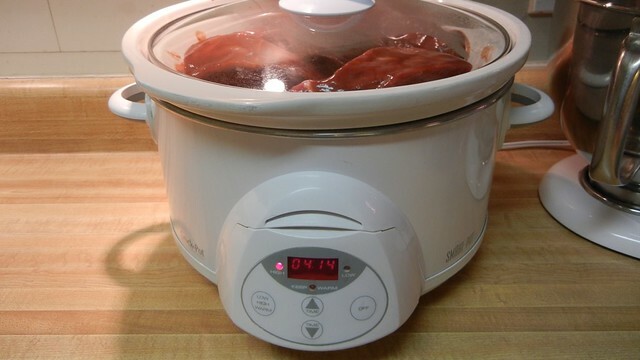 Why do I use a slow-cooker for ribs even though it’s warm here? It’s a super easy way to make ribs without it taking up a lot of time so I can concentrate on my other dishes and the actual game. Why bottled sauce and not homemade? You’re just going for the spices, and to be honest, it’s going to cook down so much, any of the beauty and subtlety you get from homemade barbecue sauce is going to be lost in 4-8 hours you have the meat in the pot. It’s not worth the effort. Just because you’re not making the sauce though doesn’t mean you shouldn’t be choosy. Read the label and make sure it’s made with brown sugar or molasses and not corn syrup. The fewer preservatives — if any at all — the better. Liquid smoke is optional. Most barbecue sauces have a little bit in them already, but I like a little more just so you can still get some of the best part of grilling without all the mucking about with charcoal. 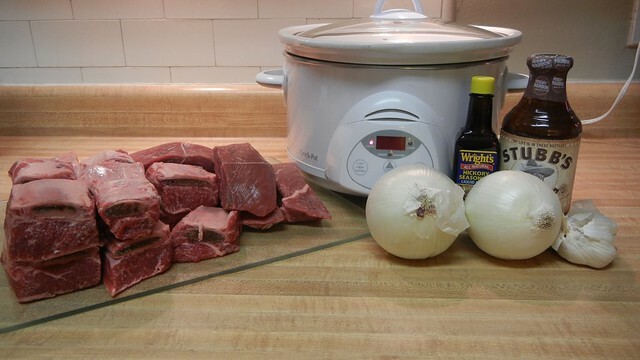 Throw the onions and the garlic on the bottom of the slow-cooker to create a base. Layer on the meat, bone side down, pouring some of the barbecue sauce between each layer. Cover with the rest of the sauce. If you’re like me and also bought a few pieces of boneless short ribs too, make sure to put those on the top layer so they don’t dry out. Add the liquid smoke. Reminder! Don’t take off the lid to check on the meat until it’s almost time for it to be done. 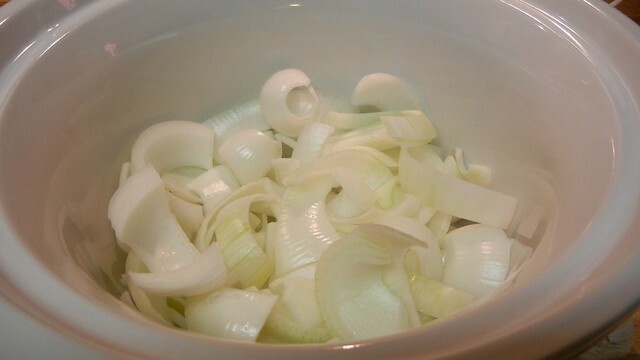 Rule of thumb, each time you take off the lid you add 20 minutes of cooking time. 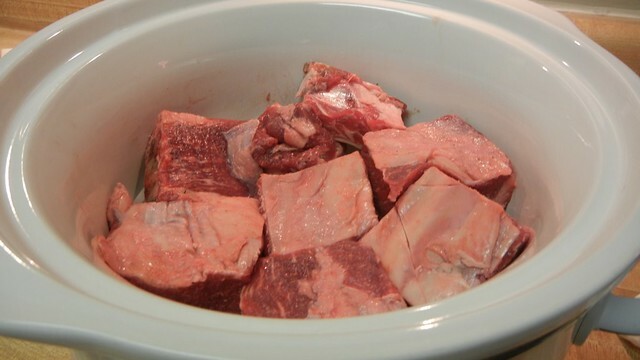 Once the meat is done, transfer it to a large platter. 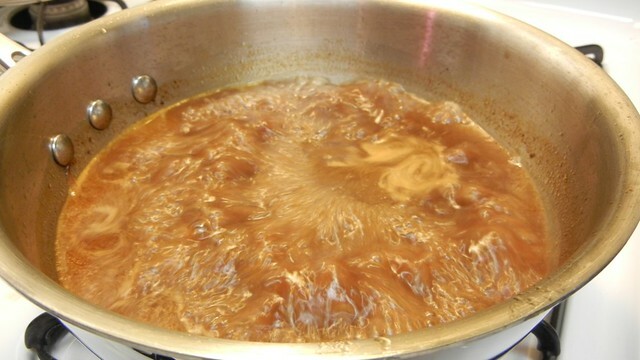 The meat and onions will have released a lot of fat and juices, so drain off the fat and reduce some of the remaining liquids in a sauce pan. 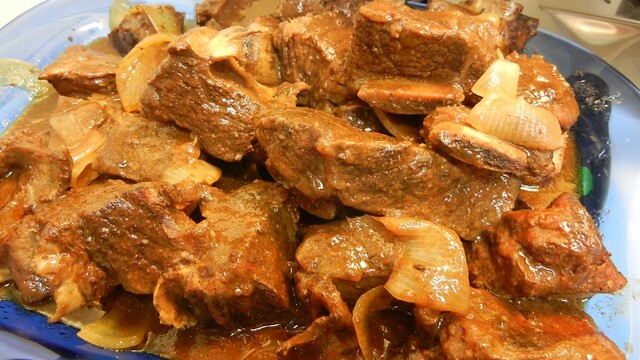 Pour the reduction over the short ribs and serve. The long steady heat will make the meat just fall off the bone while the barbecue seasonings will have been drawn deep inside of every bite. Lots of reward, little effort, and you got to stay warm inside.